This is the VF-2 Bounty Hunter's "Last Tomcat Cruise" patch created for their final cruise onboard the USS Constellation (CV-64). This is a rare patch, and I was only able to pick up a few direct from the squadron, so once these are gone, that's probably all I'll be able to get. 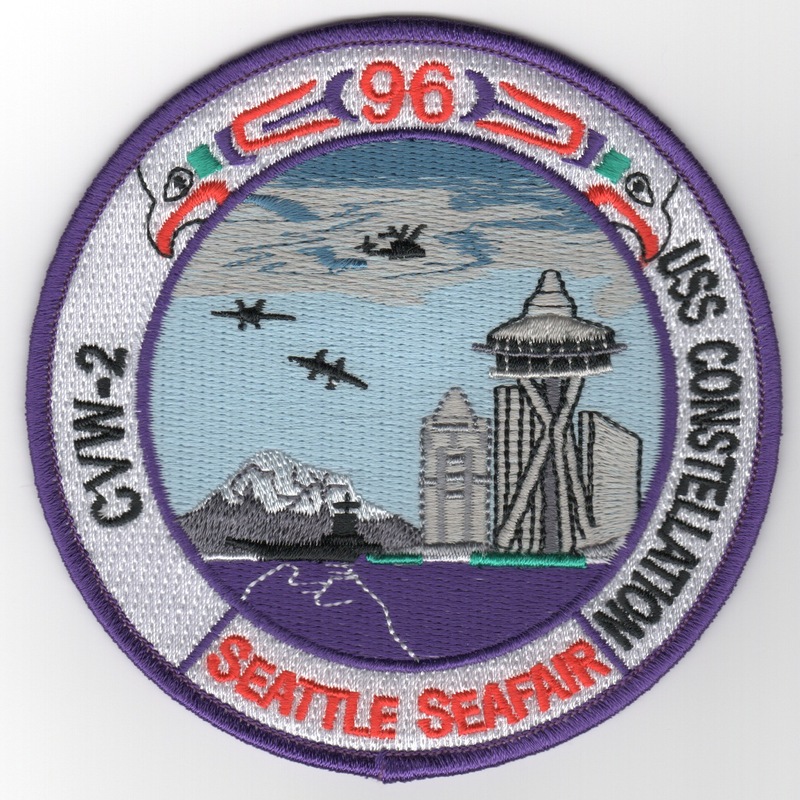 This is one of the "Farewell" patches for the USS Constellation (CV-64) created by the VF-2 Bounty Hunters for their 2003 cruise. It depicts the time served for the venerable carrier, 1961-2003. 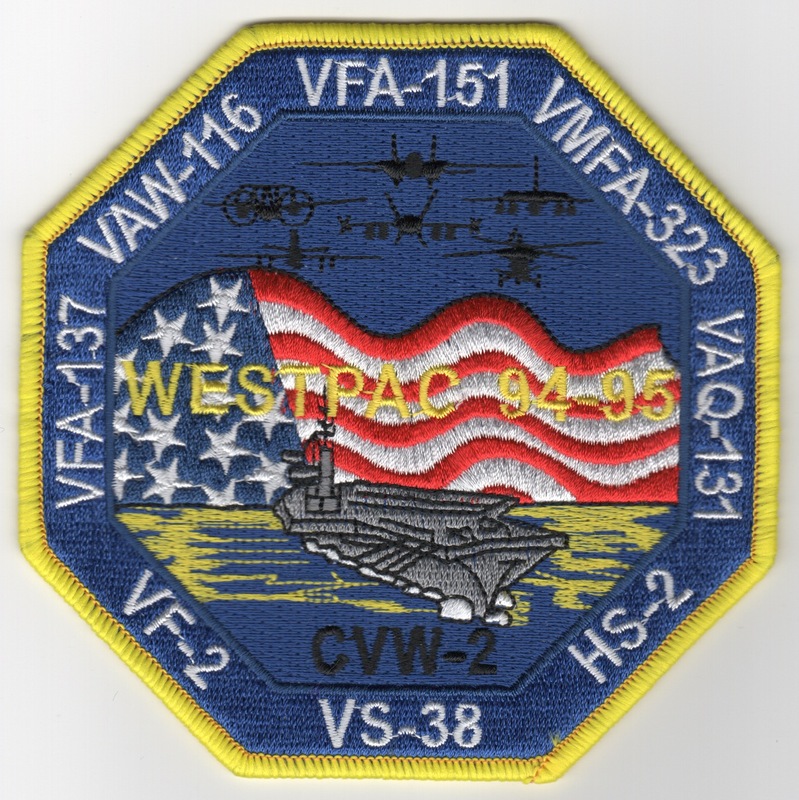 This also is one of the "Farewell" patches for the USS Constellation (CV-64) created by the VF-2 Bounty Hunters for their 2003 cruise. It's also from their Operation Iraqi Freedom cruise and shows the "Magic Carpet" ride they took while attached to the airwing that's attached to her. It depicts the time served for the venerable carrier, 1961-2003. 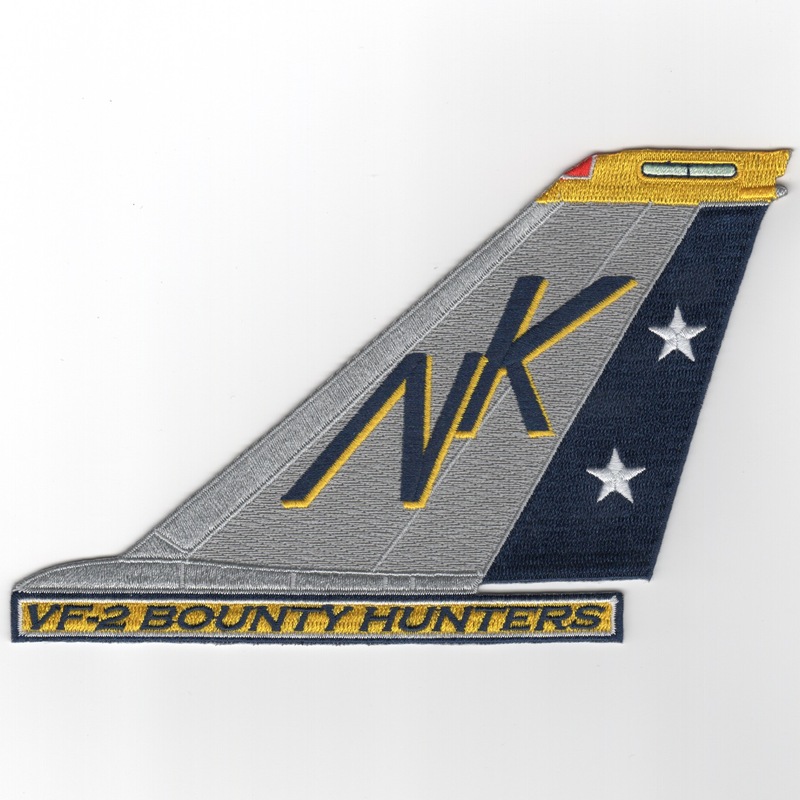 This is the 1992 Operation Southern Watch cruise patch for the VF-2 Bounty Hunters. Along the top, it says "Southern Watch", "TARPS", and the dates "17 Sep 92" and "02 Dec 92". Along the bottom, it says "The Only Show in Town" and "Bounty Hunters". Scan isn't very good, but the patch is nice. Was only able to get a few dozen of these, so they will probably go fast. 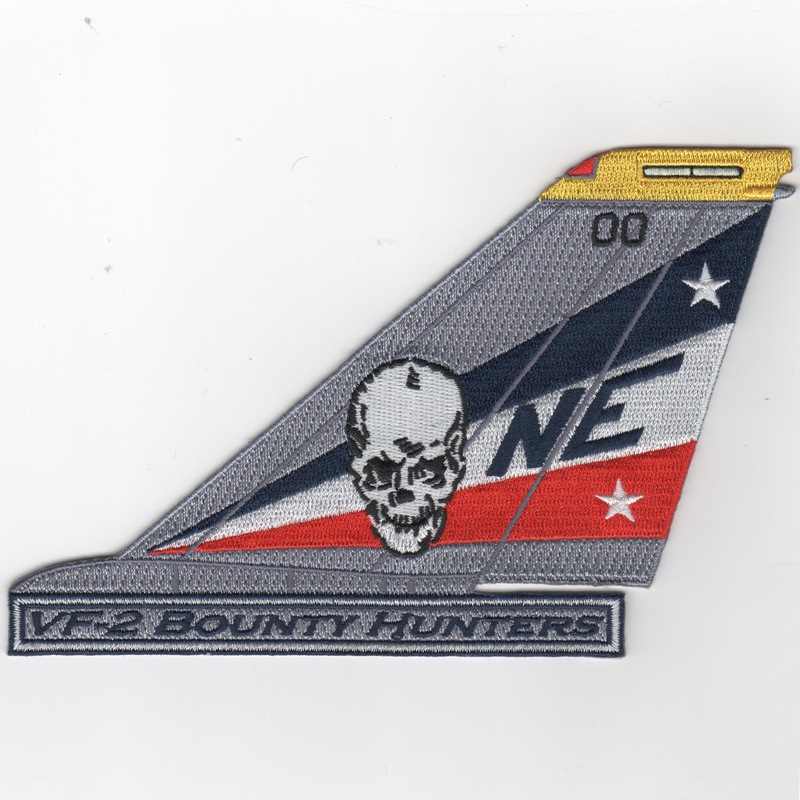 This is the large version of the "Bounty Time, Baby" skull patch for the VF-2 Bounty Hunters squadron. It shows the "death skull" watching you, and has their coloring in the stripes behind it and the lower half of the yellow fresnal lens in the background. Awesome patch! 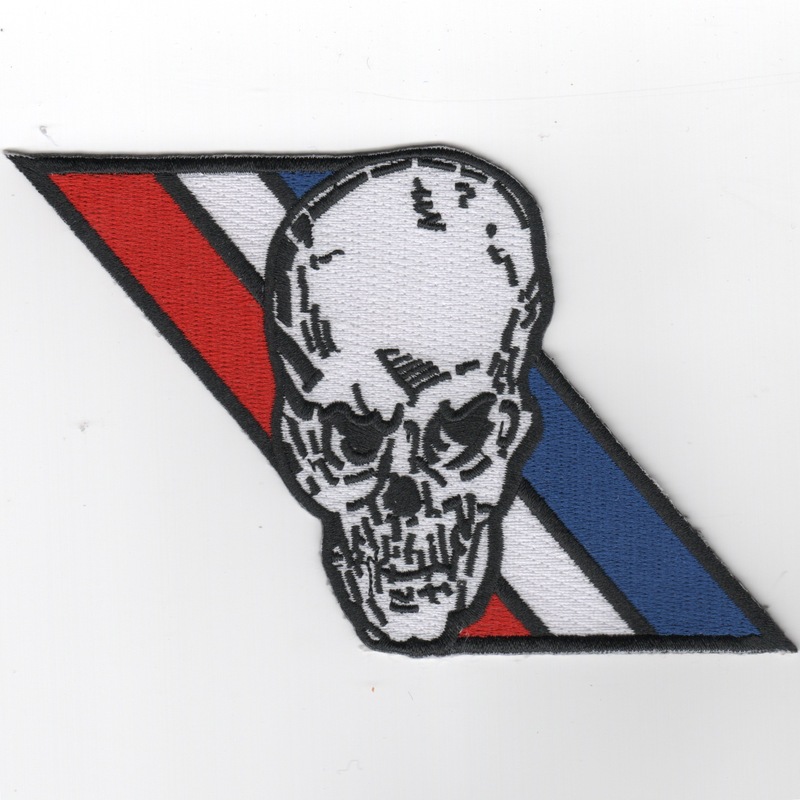 This is the "skull" patch for the VF-2 Bounty Hunters squadron. It shows the "death skull" watching you, and has their coloring in the stripes behind it. Awesome patch! Back in stock!! 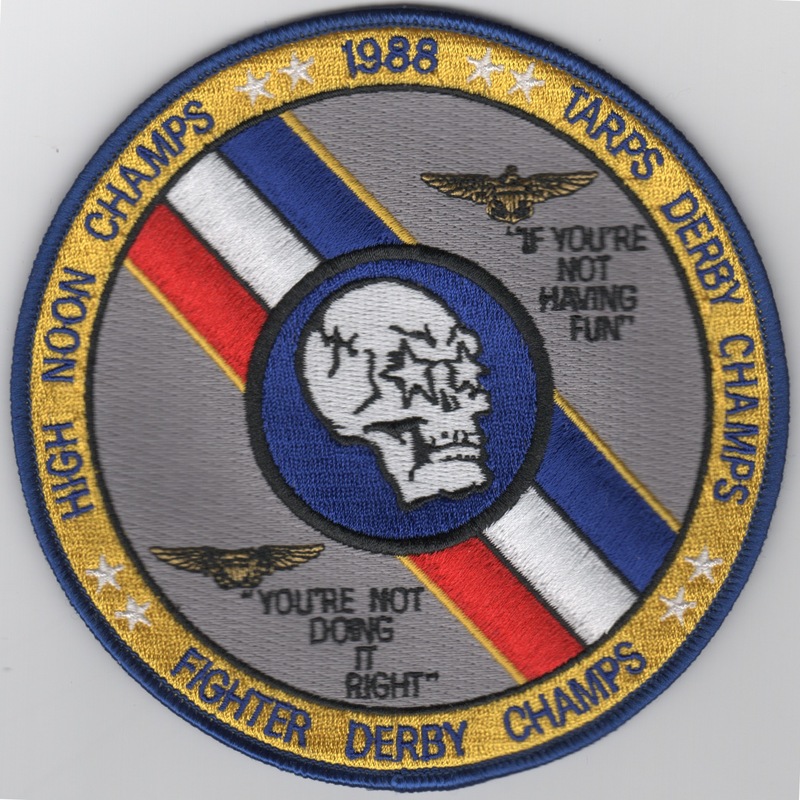 This is the patch created by VF-2 to commemorate their 1988 "High Noon Champs", "TARPS Derby Champs", and the "FIGHTER Derby Champs" victories. It says "If you're not having fun, you're not doing it right". This patch does not come with velcro already attached. This is the color version of the nametag used by the RIOs/WSOs of VF-2 (now VFA-2). This is the color version of the current squadron patch for VF-2. The 'Bounty Hunters' are a Tomcat squadron that is now stationed on the East Coast, but cruise with West Coast boats. They were established in October 1972 and received their first Tomcats in 1973. They are a TARPS squadron and have established many firsts for their carrier and airwing. 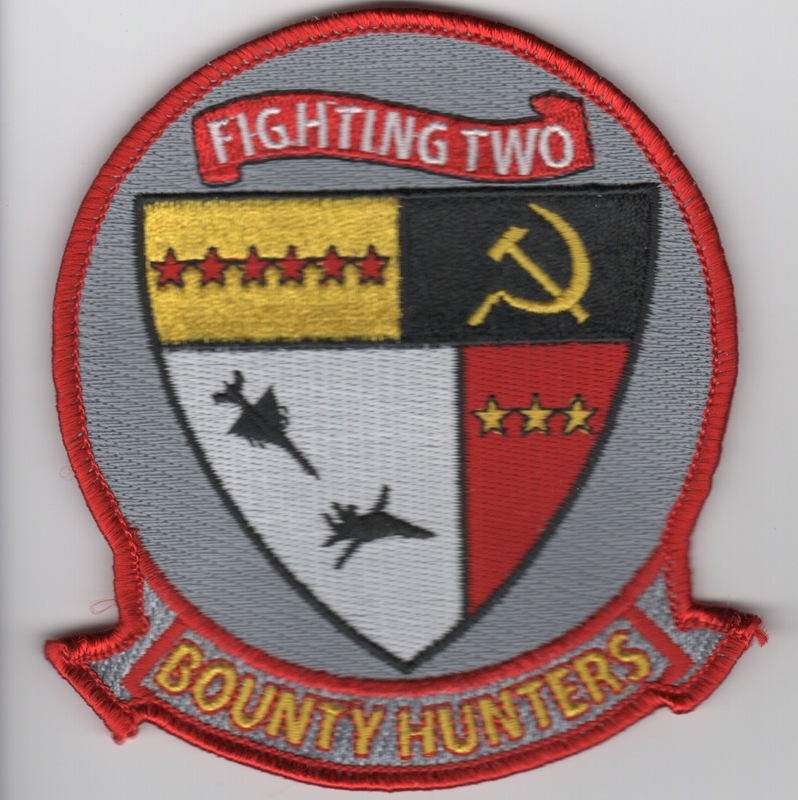 This is the "red-bordered" version of the squadron patch created for the Bounty Hunters that they wore when playing the role of "ADVERSARY" during different exercised/workups. You can also see the Russian "Sickle" on the shield in the upper left corner. This patch does not come with velcro attached.. 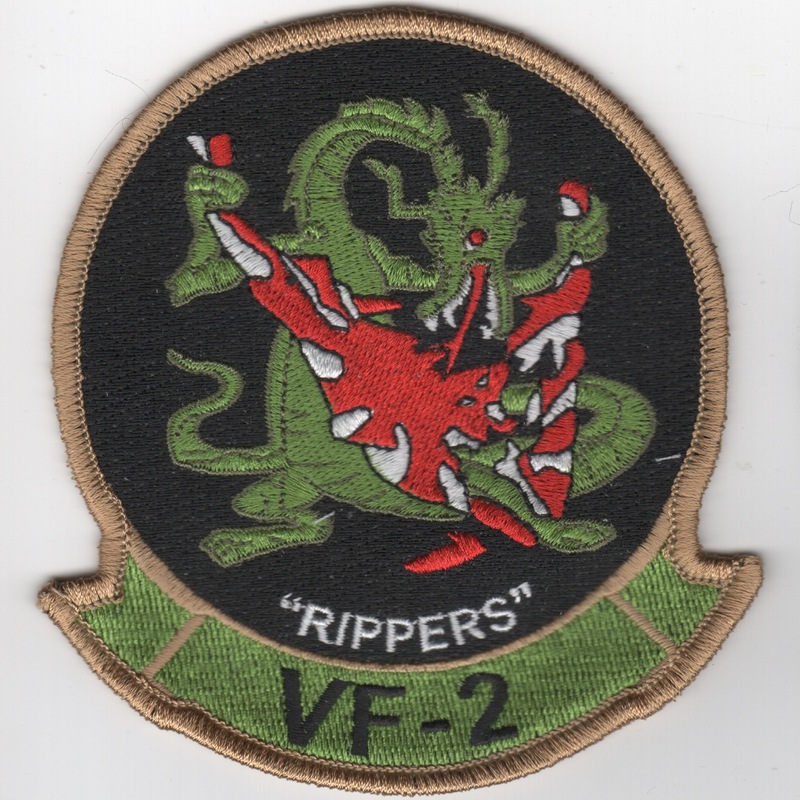 This is the des/subdued version of the HISTORICAL "RIPPERS" squadron patch for VF-2. Fighter Squadron 2 or VF-2 was an aviation unit of the United States Navy. Established on 1 June 1943, it was disestablished on 9 November 1945. It was the third US Navy squadron to be designated as VF-2. 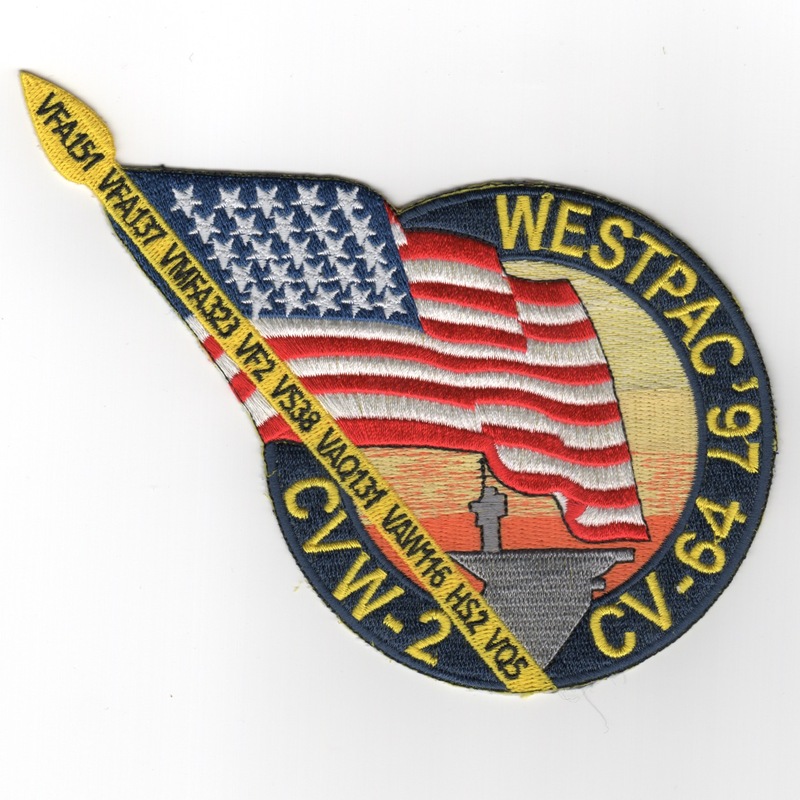 This was created as a "legacy" patch for the squadron and does not have velcro attached. This is the round version of the shield patch for VF-2. The 'Bounty Hunters' are a Hornet squadron that is stationed on the East Coast, but cruise with West Coast boats. They were established in October 1972 and received their first Tomcats in 1973 and their Hornets in 2004. They are a TARPS squadron and have established many firsts for their carrier and airwing. This is the desert version of the current squadron patch for VF-2. The 'Bounty Hunters' are a Tomcat squadron that is now stationed on the East Coast, but cruise with West Coast boats. They were established in October 1972 and received their first Tomcats in 1973. They are a TARPS squadron and have established many firsts for their carrier and airwing. This is the award patch for the VF-2 Bounty Hunters for their achievement of the Battle "E" in 1991 and does not come with velcro attached. 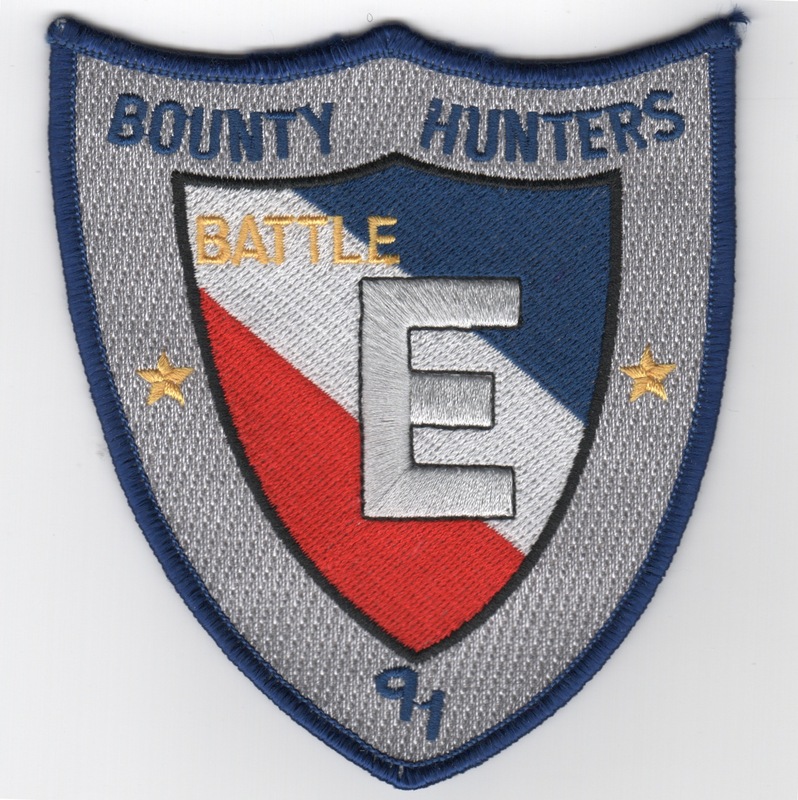 This is the award patch for the VF-2 Bounty Hunters for their achievement of the Battle "E", Safety "S", and the Boola-Boola in 1997. VF-2 is an F-14A Tomcat squadron stationed on the East Coast, but cruises with West Coast boats. They are a TARPS squadron and have cruised on several 'boats', and have achieved several obscure firsts: They were the first to launch from a carrier deck while towing an air-to-air gunnery banner. This is their TARPS patch and denotes both aircrew with the 2 Tomcats. Sorry it's more expensive, but these came from Japan, a port where they sometimes pull into when on cruise. VF-2 is an F-14A Tomcat squadron stationed on the East Coast, but cruises with West Coast boats. They are a TARPS squadron and have cruised on several 'boats', and have achieved several obscure firsts: The were the first to launch from a carrier deck while towing an air-to-air gunnery banner. 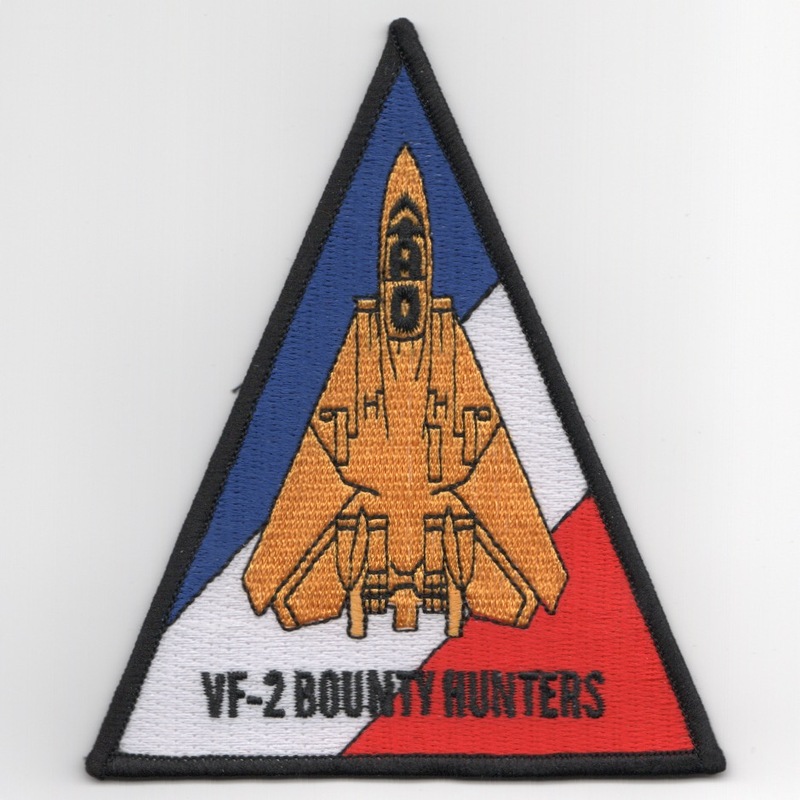 The VF-2 'Bounty Hunters' are well known around the world and have accomplished many "interesting" claims, of which are intercepting a SU-15 "Flagon", MiG-23 "Flogger", "Bear" and "Badger" bombers during a 1986 USS Ranger West coast cruise. They also logged the USS Ranger's 260,000th trap. This is the F-14 aircraft triangle patch worn on the right sleeve of their flight suits. It does not come with velcro attached. 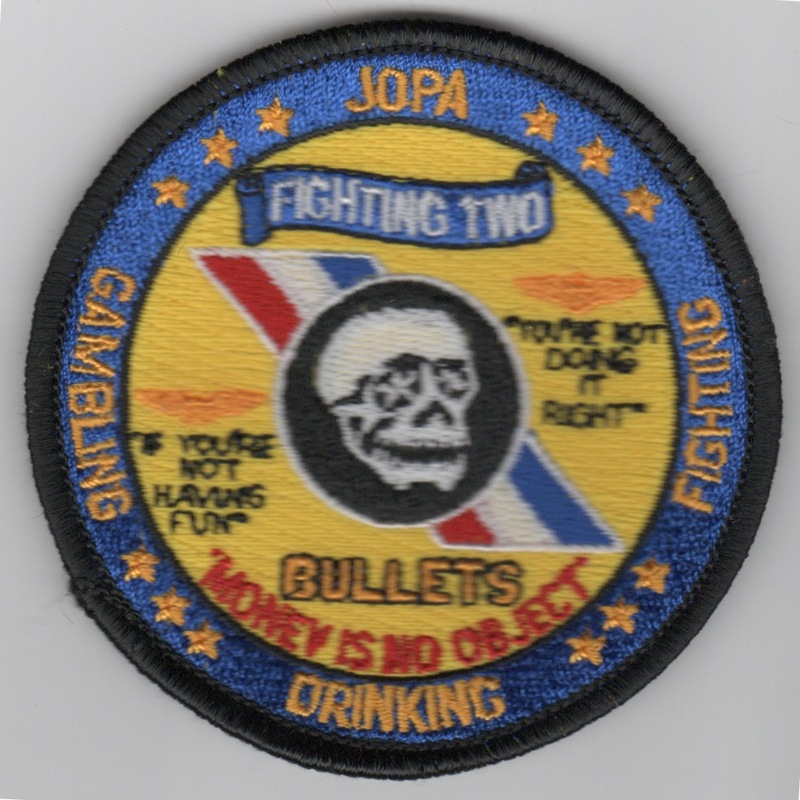 This is the VF-2 Jr Officer Protection Agency (JOPA) patch created for the JO's in the squadron. It says "Money Is No Object" along with several other sayings......no velcro. 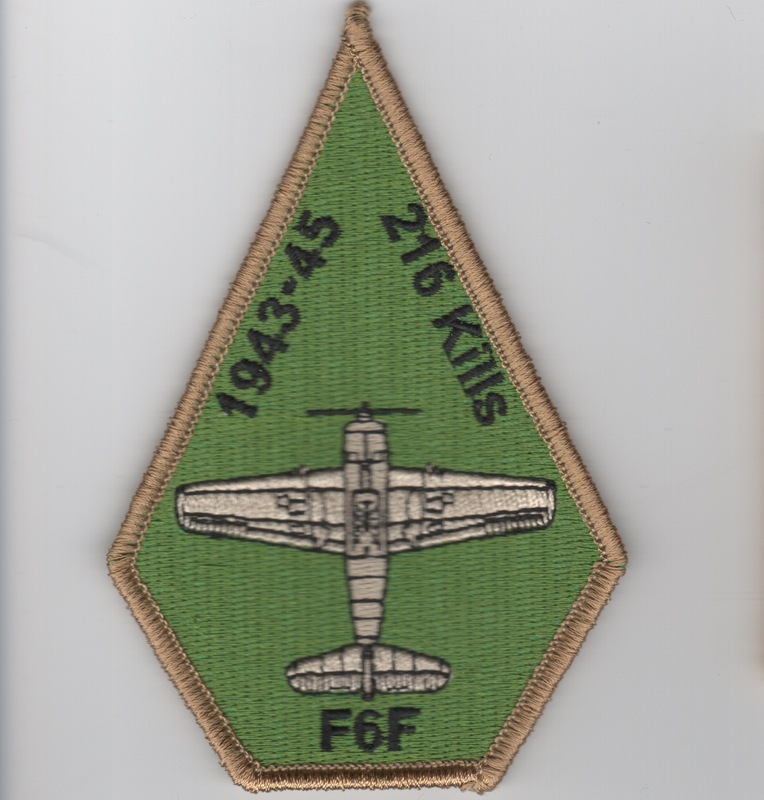 This (first version of this) patch was created by the squadron as another "legacy" patch commemorating the F6F, one of their lineage aircarft, having 216 kills from 1943-1945. This patch does not come with velcro attached. 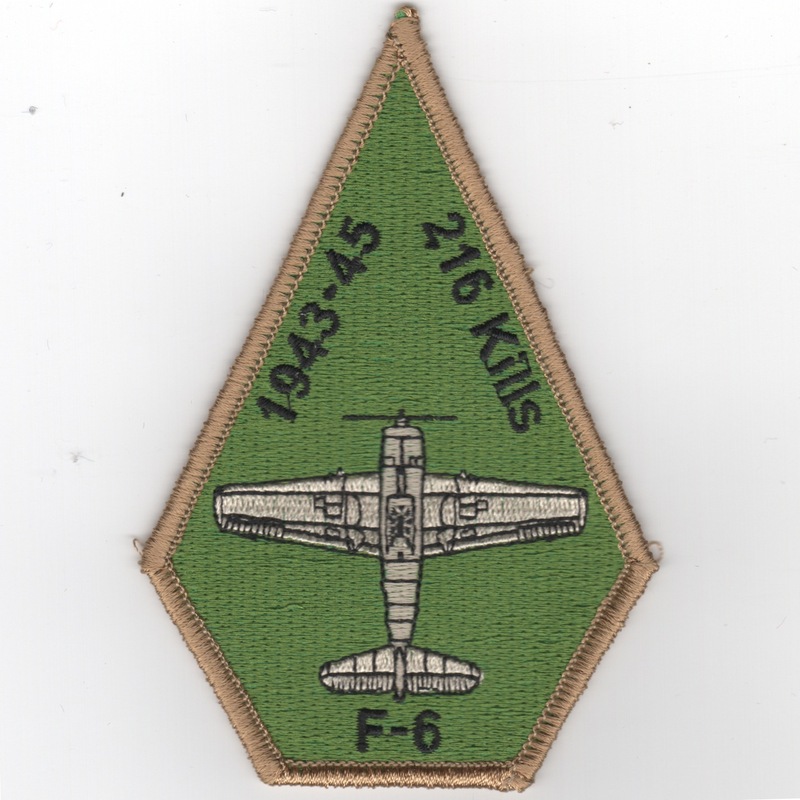 This (second version of this) patch was created by the squadron as another "legacy" patch commemorating the F6F, one of their lineage aircarft, having 216 kills from 1943-1945. This patch does not come with velcro attached. Homepage | Order VF-2 Patches!